St. Barth's fourth annual Gourmet Festival will be held this year from November 1-4, 2018. Organized by the Saint Barthélemy Tourism Committee, this celebration of French gastronomy is now a major event on the international culinary calendar and attracts foodies from around the world. 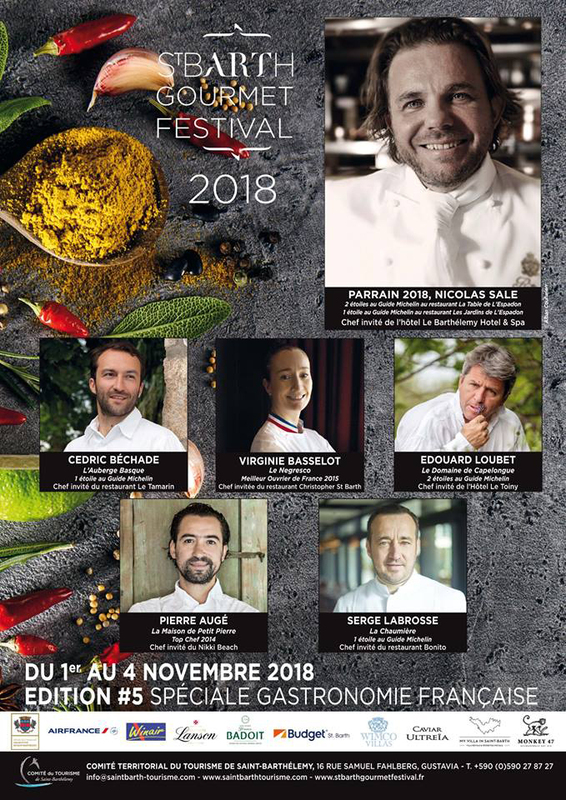 This year the Festival’s patron chef is NICOLAS SALE , Chef of the restaurant La Table de l'Espadon * and the restaurant Les Jardins de l'Espadon at the Hotel Ritz Paris. Nicolas Sale was also voted Chef of the Year 2017 by Le Chef magazine. The festival dinners will be held at a variety of venues including the Hotel Christopher, Le Barthélemy Hotel & Spa, Hotel Le Toiny, Nikki Beach, Le Tamarin and Bonito. Each chef will create a multi-course signature menu. These dinners will be served over three nights. Wine pairings are optional. The festival will be rounded out with other culinary activities and competitions – and fun! In conjunction with the festival, St. Barth Properties is pleased to collaborate with some of our finest villas to enhance and add value for our epicurean clients. Note: Villas may be rented based on the number of bedrooms required unless noted* (additional bedrooms are left unoccupied) and priced accordingly.